Bagasse is the sugar cane fibre left over after the juice has been extracted. Environmentally friendly companies use Bagasse to make compostable dinner ware and cutlery. Considering it takes on average 500 years or more for plastic to break down, Bagasse is the way to go! Sugarcane Plates are strong; are grease and cut resistant. They are a great alternative to plastic or polystyrene. Sugarcane is a rapidly renewing resource that takes only 18 months to grow and harvest. Sturdy – no need to double up. Made by World Centric and shipped by bGreenToday on Amazon, they sell bagasse biodegradable bowls and plates in various sizes as well as other eco friendly products. EarthSmart are another great eco brand to consider supporting. They offer biodegradable plates, spoon, knives and forks as well as toilet paper made from bagasse. Great for people who spend alot of time outdoors. Sold on Amazon. 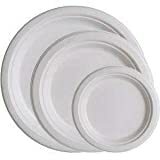 EarthSmart Biodegradable plates are available for purchase in bulk on eBay as well. Apart from using biodegradable products made from bagasse; knives, forks and spoons made from plant starch are available in bulk lots. Eco friendly cutlery are made by Jaya Plant. Shipped by Stalk Market and listed on Amazon. More environmentally friendly products can be found in Amazon’s Green Home & Garden Section.